Depuis de nombreuses années déjà, le système d’information est devenu un support indispensable à la stratégie et aux activités des Entreprises et des Organisations. L’essor du Big Data confirme l’évolution du SI avec l’accès à des données hétérogènes et en grand nombre. Malheureusement, l’apparition de nouvelles menaces, ainsi que la pression règlementaire démontrent le caractère indispensable de la gouvernance du SI et de la gestion opérationnelle de la sécurité et impliquent l’adoption d’une posture de sécurité dynamique. Face à ces enjeux,les entreprises doivent non seulement trouver les meilleurs experts et savoir les garder, mais elles doivent aussi s’organiser avec des équipes et des processus adaptés à leurs exigences et enfin, elles doivent s’appuyer sur technologies éprouvées qui leur permettent d’anticiper et de détecter les menaces. Dans ce contexte d’enjeux toujours plus important, les technologies de SIEM sont devenues essentielles. La technologie HP ArcSight, solution leader dans le marché du SIEM, a contribué à améliorer de manière significative la posture de sécurité de milliers de clients à travers le monde. Ces clients sont des acteurs de secteurs industriels de l’aéronautique et de la défense, l’énergie, les services, la finance, la santé, les hautes technologies, l’assurance, la distribution et les technologies de communications. While users are more mobile than ever, that flexibility has also come with increased risk. As business managers push for more mobile apps, faster development, newer features and broader distribution of these apps, the businesses’ risk exposure grows exponentially. Organizations are at risk of exposing their corporate data, losing brand equity, and ultimately suffering financial loss through breaches of their mobile applications. IT must ensure these apps are secure, even if they are developed by a third party, so understanding the mobile vulnerability landscape is critical and its tough to keep this expertise in-house. HP Security Research leveraged HP Fortify on Demand (FoD) Mobile to scan more than 2,000 mobile applications from more than 600 companies, revealing alarming realities regarding the sheer number of applications vulnerable to attack, as well as the most common and easily addressable vulnerability errors. 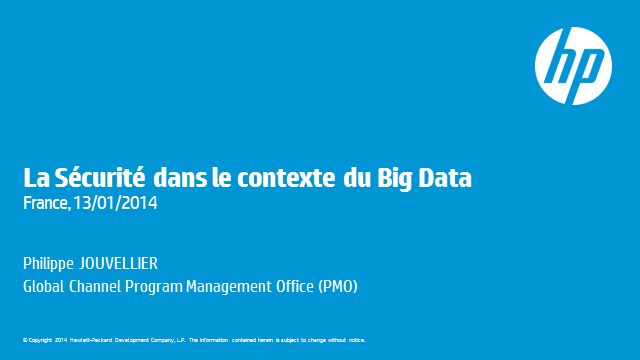 The presentation will discuss both the promises and challenges presented by big data analytics to information security. To help take advantage of the former without the penalty of the latter, we will learn about the building blocks of a big data security solution and explore the most cost-effective uses of big data analytics to enhance security. While threat intelligence promises to help with the effective detection of advanced threats, it usually achieves the opposite: detecting the most predictable attackers. To be included as part of a vendor provided threat intelligence feed, an attacker must have tried attacking several potential victims before, and must have used the exact same method to be captured in the threat intelligence feed. In this presentation we will see how to make threat intelligence valuable for detecting advanced targeted threats directly aimed at your organization. We will see how to create a threat intelligence feed close to the target, as a shared effort between departments, subsidiaries or organizations working closely together to ensure identification of targeted threats. In addition we will see how to extend the term intelligence into additional detection mechanisms such as behavioral patterns. Web applications continue to represent a major source of risk to organizations. Not only is the number of web application growing but the associated risk is increasing as they are evolving from informational web-sites to interactive sites that capture customer data. The IT security teams are aware of the problem but all too often do not have then bandwidth to effectively assess these application or the budget to engage expensive penetration testers to do the work on their behalf. The problem is compounded as now it’s not only web-sites that need to be secured but Facebook and mobile applications too. In this webinar, you will learn how Fortify on Demand, HP’s cloud based application security testing service, can provide a cost effective solution to all your application security testing requirements. With Fortify on Demand you can start testing within a day, scale rapidly to test all your applications, whether they are developed in-house or produced by third-parties, and importantly support the developers to fix any vulnerabilities that we find. In today’s ever evolving threat landscape and with the increasing requirements by the business users for access to business information from various locations and from a multitude devices, the Information Security Professional is required to understand the threats and the mitigation techniques available to them. During this presentation we will explore the attackers motivation and understand their eco-system and then we will look at how users are being leveraged to gain access to our business information. Lastly we will look at ways we can mitigate the kill chain at various stages and provide better reporting to the business stake holders. The rapid adoption of mobile devices has created significant security risks and challenges for IT organizations. In a recent study by HP of 120 mobile applications for a single enterprise customer found that 66% of applications contained vulnerabilities that could have led to the disclosure of personal data or the compromise of a back-end system. In this webinar you will learn more about these vulnerabilities and how you can identify and remediate these risks. With the modern and emerging threat landscape, it is clear that adding more and more layers isn’t going to provide the answers that it once did. Using a joined-up approach, it is possible to start to build a true solution that helps manage the risks and threats, and to provide visibility that wasn’t previously possible. Addressing security at the network and application layers and proving a real-time view of the risks and threats as they happen, it’s now possible to start to address these new emerging threats. Importantly though, by using this approach, it is possible to be prepared today and tomorrow to provide pro-active identification and resolution to the threats. The business is demanding more apps and more channels for customer engagement. In turn you know this means more risk. The app development team is swamped just trying to keep up, and your security team is stuck in the middle, trying to secure what you already have - let alone all this new stuff. Sound familiar? Join us for the 2013 results presentation of the second annual Cost of Cyber Crime study for the United Kingdom and Germany. For the first time, the research was conducted in France. Conducted by Ponemon Institute and sponsored by HP Enterprise Security, a total of 110 UK, German and French organizations participated. According to the findings, cyber attacks increased 16 percent in the UK and 21 percent in Germany. The costs associated with this increase in the UK and Germany were £904,886 and €830,169, respectively. For the first time, it was determined that the average cost of a cyber attack in France was €3.89 million. Findings from the report also show that each week UK and German organizations experienced on average 1.3 successful attacks per company. French organizations experienced an average of 1 cyber attack per company. Evidence is mounting that current IT security models are simply no longer sufficient to support the hybrid enterprise. The extensive flow of enterprise information, well beyond the traditional purview of IT, necessitates an expansion of security scope to identify and control vulnerabilities. Lack of focus can be putting your information at risk. This session reviews findings from the HP Enterprise Security Services Security Assessment Report. The report utilizes data and survey responses on customer security maturity assessments. The Enterprise Security Kill Chain concept describes the five steps of a security breach. This session will describe the steps that attackers use and suggestions that organisation can use to identify and mitigate these attempts and reduce risk. Rich Agar CISSP has been working in the IT industry since the late 1990’s. He has worked as a freelance consultant, at systems integrators and vendors with various customers across the UK and Europe. Rich holds a Master’s degree in Information Security from Royal Holloway, University of London, and is currently working as a Solutions Architect for Enterprise Security at Hewlett Packard. Enterprises today have become highly extended environments with multiple users inside the network at any given time. That extended enterprise also includes multiple vendors and suppliers, but nearly half of reported breach incidents are the result of a mistake by a trusted supplier. Protecting the enterprise from both inadvertent and malicious errors requires extension of enterprise compliance requirements across the supply chain. In this webinar, we will cover security compliance services that enhance budgeting and spending effectiveness, expand visibility, reduce complexity, and improve compliance reporting; resulting in better cost control, faster incident reaction, reduced risk exposure, and better audit response. Distributed denial-of-service (DDoS) and web application attacks can be critical threats to your enterprise. Defending against them takes a comprehensive cloud-based managed service coupled with on-premise DDoS appliance solutions. Learn how to effectively maintain availability and defend your enterprise from denial-of-service attacks using HP’s new Distributed Denial of Service Protection Services. In this webinar, Michi will discuss how an organization can take the requirements of their infrastructure around operational controls, compliance and security to extend and expand them into a Security Intelligence solution. Using a use case approach, organizations can look to extend and build upon their existing systems and controls to provide real-time warnings and feedback that allows them to make informed decisions focused around their business needs. Rather than just having a "top 10 attacker" reports and dashboards, how about a system that focuses around application lines and how this impacts business is more useful. Cybercriminals are increasingly banding together, organizing more sophisticated attacks that are more predatory in nature. Cybercrooks’ rapid adoption of new technologies and efficacy in information sharing has trumped traditional static enterprise defenses. In order for organizations to stay protected, they must learn from their adversaries. What lessons can we learn from cybercriminals that can be applied to boost an organization’s overall security strategy? Paul Brettle, HP’s EMEA Security Specialist Manager, will examine the means and motivations driving cybercriminal behavior and how improvements such as benchmarking can persuade criminals to look elsewhere for targets while helping security professionals develop stronger defenses. “The new information security frontier is applications, and for many this means SAP, which is the backbone of IT in many organizations but is little understood by most. While the number of security notes and patches for SAP increases exponentially, solutions still focus on authorization and entitlement management, leaving a security gap in areas such as misconfiguration, patch management and application security and abuse of trust. In the Webinar we will discuss AgileSI, an innovative solution which utilizes an approved SAP add-on and HP ArcSight to help protect your SAP systems. iT-CUBE SYSTEMS is a privately held company headquartered at Munich, Germany. The company was awarded in December 2012 with the Deloitte Technology Fast 50 Award Germany. Enterprise is adapting to embrace new technologies and capture new opportunities. Cloud capabilities are attractive, but concerns for information security remain. In this webinar, Dr. Jeremy Ward will discuss how you can adapt and embrace change, while maintaining the security of your infrastructure and information. The key points discussed will include choosing a security service that helps you form better cloud security strategies that manage data risk, reduce complexity, identify vulnerabilities, and ease user access; resulting in improved security governance, enhanced visibility, increased cost control, and reduced risk exposure. In this webinar we will discuss how an organization can take the requirements of their infrastructure around operational controls, compliance and security to extend and expand them into a Security Intelligence solution. Using a use case approach, organizations can look to extend and build upon their existing systems and controls to provide real-time warnings and feedback that allows them to make informed decisions focused around their business needs. Rather than just having a "top 10 attacker" report and dashboard, how about a system that focuses around application lines and how this impacts business? For the past 5 years Paul has been working for the market leading Security Information and Event Management (SIEM) solution, HP ArcSight. Spending considerable time assisting organizations across the EMEA region to define their needs, understand their threats and risks and architect SIEM solutions to address this. Focusing on: Risk management, threat intelligence, SIEM solutions and architecture, log management, correlation and vulnerability management. The days of locked down security are over. Today’s enterprise must be as fluid as the clients they serve, sharing information whenever, wherever and on whichever device they choose. This new fluidity requires a comprehensive approach to security to enable interaction while driving operational effectiveness and reducing business risk. Getting to your secure enterprise is a journey and we have designed capabilities to help you get there. Are you ready to begin the journey to your secure enterprise?